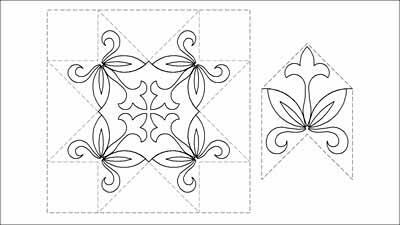 4 repeats of this darling little pattern segment stitch out very quickly to form a lovely design in a small to medium sized Sawtooth or Ohio Star. It is also placed very quickly and accurately - 4 clicks and you are there! there are other patterns available for these shapes! It is one of the patterns included in the full Annie set. reasonable 'wiggle' room is left around the main elements of the design - happily allowing for those 'not so perfect' piecers, or where the fabric has moved somewhat on the machine.